Shadow Copies can be a lifesaver – when used correctly. They are not a replacement for backups, but can sometimes stop you reaching for that backup tape stored in the depths of the IT office (yes, in that cupboard!). 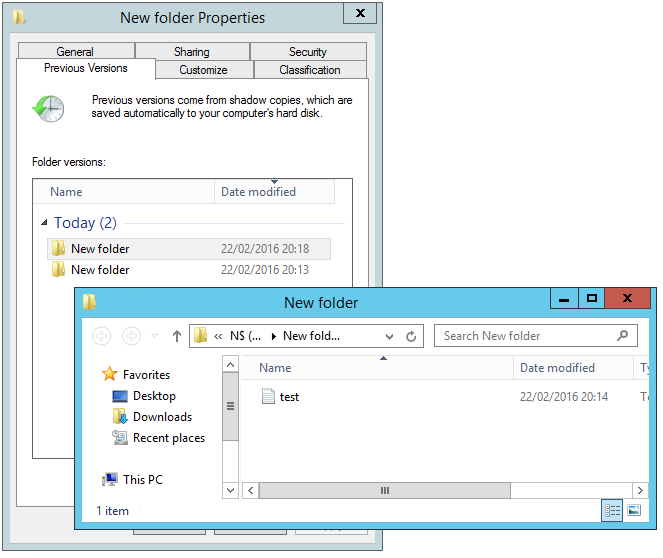 I recently had a user who managed to delete an entire folder from a shared area – by accident, of course(!) – they owned up to this quickly and we were able to restore the folder back with minimal data loss in a very short space of time. Had we had to restore from backup, this would’ve taken some time – resulting in productivity loss (you know how it is!). In this case, it was lucky the user came forward and let us know that the folder needed restoring. If they hadn’t, we would have needed to dive around in audit logs, or use a product like Netwrix Auditor for File Servers to work out what was going on. This is great, but how do you set it up? I would recommend enabling Shadow Copies on pretty much any File Server volume, unless you have a good reason not to – very high expected disk IO, high turnover of files, temporary storage area etc. To start with, let’s create a virtual disk to play around on. On Windows Server, open Disk Management (WIN+X, Disk Management) and press Action -> Create VHD. Hit browse and save the disk somewhere easily accessible. Here, I’ve put it on the ‘M’ drive and given it a size of 1GB just to play with. 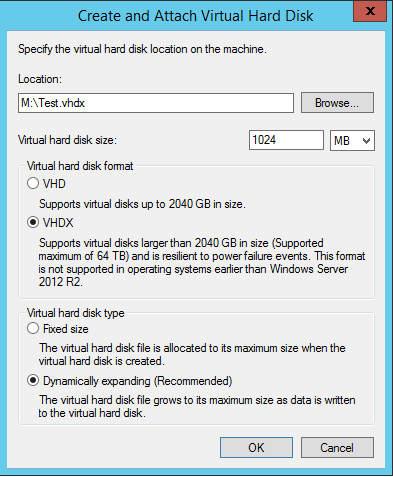 If you’re using Server 2012 R2 (and you should be), select the VHDX option. It is far more efficient and uses the characteristics of the underlying drive hardware to enhance performance. Finally, select either Fixed or Dynamically expanding (basically thick or thin provisioning). VHDX has less of a performance hit when using Dynamically expanding, but still something to take into account if your storage infrastructure isn’t up to much. Right click the volume and choose properties, then the ‘Shadow Copies’ tab. Click on your drive letter and press ‘Settings’. Either choose an appropriate limit, or select ‘no limit’ for the maximum size, then press ‘Schedule’. Shadow Copy takes a snapshot of all files/folders on the volume at given points in time. It uses a copy-on-write method, so a snapshot won’t use any extra space until files are changed from how they are in the snapshot. The default for this is 7am and 12pm (mid-day). There are several ways in which to setup Shadow Copies, and you can choose whichever suits the type of data you’re protecting the best. I normally give shared areas a shorter retention time, more frequent snapshots than single-user areas, simply because the margin for error is that much greater. Don’t forget that this schedule will compliment your backup one! When you’ve created your schedule, press OK all the way out. Let’s have a look at restoring from a Shadow Copy. To replace the copy that is currently visible on disk, simply click the version you’d like to restore and press ‘Restore’. It is important to note that this will remove any shadow copies newer than the version you are restoring! As a general rule, I copy the file and then overwrite the version on disk. Microsoft has, for whatever reason, disabled the configuration of Shadow Copies on Windows Desktops for a while now. The functionality however is still alive and very much kicking! Shadow Copies are taken when taking System Restore points (see my post on how to re-enable System Restore in Windows 10 here), or when installing Windows Updates (OS Drive only). Obviously you can replace C:\ with another NTFS drive letter if you wish. 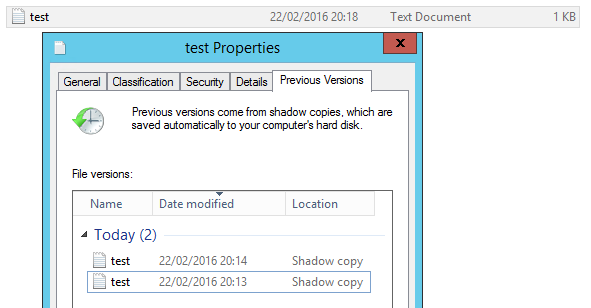 This will create a Shadow Copy for the C Drive, and write its ID to c:\shadowlog.txt. You can then delete the shadow copies using this file again later if you wish to. To browse this Shadow Copy, type \\localhost\c$ (or another drive letter if you did that), right click -> previous versions. Again, the 64-copy limit remains, so if you decide to put that command in scheduled tasks, don’t schedule it too often! I’ve found that twice per day is usually good enough. That’ll read each line in turn from C:\shadowlog.txt (which contains a list of IDs), deletes the shadow copy from disk and finally deletes the shadowlog file. Personally, I prefer to put file servers in virtual machines and make the VM highly available instead. I would also recommend against changing the location of the shadow copy. When you change to a different drive, you are effectively doubling your chance of data loss (2 drives to fail). Also, when you read or write to a file with shadow copies on a different volume, Windows will have to read the base file, then any shadow copy data from the other drive before it gives you the data. Well, single VM highly available (or NOT), is still a single VM to fail. And a problem with updates etc. 2 VM file server cluster is an obvious answer. But the fact that drive letter can not be easily (at all?) configured for Shadow Copy is a bugger. I do NOT need to daily backup vhdx with Shadow Copy data on it, if it is on same drive then I backup even more data that is totally unnecessary. I agree with your point about updates taking the VM offline – a 2 node file cluster is one answer, the other being a DSFR setup which is what we use. Nice find with the forum post – it has a few limitations that you should be aware of in production.. firstly, the previous versions tab doesn’t work on clients (they don’t know which server to get the version data from). Secondly, if the shadow copy disk goes offline and then returns, you lose all shadows of the data. Thirdly, (I haven’t verified this), but you might be duplicating writes – one set to the data disk and one to the shadow data area. hi everyone. a question that make me couldn’t sleep is “why the default if from 7am to 12pm”? is the a reason for that? I can’t find an official reason for this, but it’s most likely because 7am is before the work day starts and 12pm is just before everyone goes off to lunch!